This is also a major factor in the current opioid crisis, because opioid drugs were over-prescribed in an attempt to control their discomfort. CTFO carries several CBD-based products that chronic pain customers use along with other therapies. The CBD oil is favored by many people who are trying to deal with pain as well as to reduce the intake of other forms of relief. 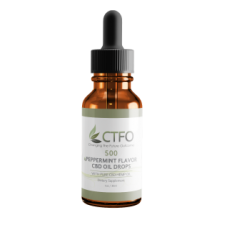 CTFO’s full spectrum oil comes in multiple strengths: 300, 500, 750 and 1500 mg. It is taken in droplets under the tongue once or even twice a day. The full spectrum oil is designed to support your wellness goals, you will never feel any “buzz” from CTFO’s CBD oils! For those who have sensitive jobs and are required to take drug tests, CTFO also carries have CBD Isolate oils in 500 and 1500 mg strengths. These oils are THC free!